Content drives traffic. Known fact. But if your website or blog is still relatively untouched by others, it’s imperative that you take matters into your own hands and share the heck out of it. Lets say you write a blog, or better yet, lets say you write short bulleted tips on your website that you want others to see so that they might understand the great value you offer. Helpful tips. The more the subject is re-enforced across media platforms the more weight your content holds. After a while even you, even I, Master Online Thinker Extraordinaire, will eventually run out of ideas, or get tired and need to take a content break. I mean really, what are we, machines ? 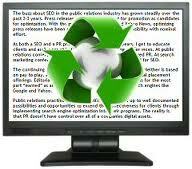 There are many formats that allow for power transformation and the subsequent sharing of content. Simpler to create these days than ever, the power of video is strong for a few reasons. In terms of traffic strategies it is undeniably one of the most effective ways to grow your list and bring strong link juice from an outside source and search engine in its’ own right. YouTube- which just happens to be owned by Google, who, if optimized well, will showcase your video above most written articles/blogs/interviews, etc. in its’ ranking when people search by keyword. Test it out on your own- type in a search term, like, traffic strategies, lets say into a Google search and see what ranks high. As competitive a term as it is, 9 times out of 10 Google will index a video with the same search queries higher than a non-video item. Of course within that video you are providing a LINK to your website, and voila. Exposure/traffic/link juice, all powered by Google. So take that stale blog post, re-purpose it into a video and not only are you re-enforcing your message and your brand, but you are getting it out in front of a new audience and building traffic back to your site. People love PDF’s when they are easily downloadable and easily shared. A simpler concept I’ve yet to find in terms of driving traffic. It’s that KISS formula rearing its ugly head again. One of the highest converting pieces on my site stems from my free offer for my report: “Rock Your Website to the Top Of Google”, which originated from my earlier blog posts-edited, re-formatted and re-purposed. In exchange for this very valuable piece of content – if I do say so myself- one must input their email address, with the understanding that they are now on my list and I can market to them. It is my biggest call to action and it works. As with video, creating Podcasts uses the leverage of not only re-purposed content (read the piece/record the piece/switch it up and interview someone on the content, etc. ), but your podcast is lifted and promoted on iTunes, a search engine with just as much juice as Youtube. Embedded on your site as well as in iTunes, once you learn the techniques to promote and share, the power of a podcast is impressive. As with video, there is something about hearing someone’s voice that connects people to you. I have been a guest speaker on 2 different power bloggers podcasts( say that 3 times fast) and those podcasts have given me traffic—and they’re not even mine! Extra bonus: podcasts are so mobile. I listen to them in the car, on the train, in the rain and on a plane. Careful here though, because many owners of these host sites look for content to be unique and NOT re-purposed, for fear of the Google Penguin and Panda Duplicate Content Boogie Man. When guest blogging, if you are using re-purposed content, be sure to include a link-back to the original post-which you will want to do anyway. It’s the difference between “citing”, and “scraping”. If the host site insists on unique content, a little ingenuity and re-crafting of existing work will work. Think of the power and influence you receive when you are viewed as the “expert” on a certain subject, on a blog or website that receives huge traffic of its own. With luck and time you’ll receive links, interaction and a new following, from the host sites list. Last but not least, a highly powerful source of incoming traffic can stem from a well optimized key word rich press release. I often (shhh) take an article and translate it into a Press Release and then release it on PR Underground. I have personally witnessed Alex Miranda, CEO of PR Underground upload a press release and with live streaming watch it appear in the top 5-7 places within minutes. Truly. A well designed, content rich press release, if timely and with smart use of trends, can take the spotlight and be picked up by all the Google Authority News Aggregators, Social Networks, RSS feeds and Social Bookmarking sites like Digg, Stumbled Upon, Technorati, Del.icio.us and more, doing wonders for your SEO…with one little release. A handy tool, I use it for myself as well as for clients looking for that extra SEO push. Here’s the skinny on any form of content and its relationship to traffic building. If it’s valuable content, use it, be creative and re-invent it and promote the heck out of it. Hi Suzen, I loved your “Livin’ the Highline” video. My husband and I spent a few days last week on a mini-excursion in NYC; such fun…theater, wonderful restaurants, MOMA, Chelsea, West Village, Little Italy. I miss the city too. As always – simple, can-do tips for the website/blog newbies in all of us! you know i live by the KISS rule! thanks Barb, isn’t it the best? magical, no matter how often i do it! thanks for the offer, but i’m good. commenting here gives you an automatic link back to your blog though, with comment luv, as a thank you for commenting. see ?